CHARLOTTE, N.C. (AP) Joe Gibbs has too many winning drivers in his organization. It is a good problem to have, but one that has led to increased speculation about his plans to juggle all his talent. The Gibbs organization swept Bristol Motor Speedway last weekend as Christopher Bell won the Xfinity Series race Saturday followed by yet another Kyle Busch victory in the Cup race on Sunday. Gibbs drivers have won five of eight Cup races - including the Daytona 500 - and five of seven Xfinity Series races. It's problematic because Gibbs can't keep Bell stashed away in the Xfinity Series forever and he simply doesn't have available seats for everyone. 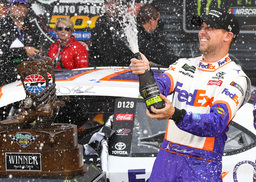 Denny Hamlin, a two-time Daytona 500 winner and two-time winner already this season, is signed beyond 2020 and so are Busch and Martin Truex Jr. Erik Jones said at Bristol he is in active conversations on a contract extension with JGR. But Bell has proven himself time and again in NASCAR's ladder system. He won the Truck Series title in 2017 and followed with seven victories last year in the Xfinity Series while making it to the championship finale. Now he's back in NASCAR's second-tier series for a second season, with the entire industry aware the 24-year-old needs to be promoted to the big leagues. Gibbs was coy on how he plans to address his abundance of riches. "You don't comment much on the future other than to say Christopher has a place with us long term, and so does Erik. That's our goal," Gibbs said. "That's what we'll keep working on. It's great to have young people coming, young talent, it's very important for us." Gibbs has made cutthroat business moves before, such as letting Joey Logano go when he had the chance to sign Matt Kenseth. While Kenseth won 15 races in five seasons with Gibbs, he also was eventually cycled out when Gibbs needed a seat for Jones. Kenseth is now essentially retired and Logano won last year's Cup championship for Roger Penske. Daniel Suarez wasn't brought back this season when Gibbs had a chance to add Truex, the 2017 Cup champion. Suarez is off to a decent start with Stewart-Haas Racing. In theory, both Hamlin and Jones opened the season on the "hot seat" because Bell is ready to go Cup racing and Gibbs needs a place to put him. Hamlin was coming off the first winless season of his Cup career, but opened the season with another Daytona 500 win and then added a victory at Texas. He bristled at speculation Gibbs would move him to make room for Bell. "Who says I'm on a hot seat? What do they know that I don't? That's what I don't understand," Hamlin said. "You all don't know my relationship with my sponsor, the team or anything. I've never once thought that someone could go out there and do a better job than I could in my own car." Jones, in his third full season, won just once last year and hasn't been as competitive so far this year as his Gibbs teammates. But he said his manager is working hard with Gibbs on ironing out an extension, and neither he nor Hamlin has felt job pressure. "I think both of us have felt pretty comfortable where we're at," Jones said. "I think Christopher is a great driver, but still when he moves to the Cup level, it's going to take time to develop. You're going to take a year or two to really get where you want to be at that level. "I feel like I'm going to be (at JGR) for a long time. I'm sure Christopher will get his opportunity in Cup at some point. He's definitely got the talent and he's good enough to do it, so he'll get there for sure." Toyota has a partnership with Leavine Family Racing that gives the single-car team technical support and assistance from the Gibbs group. Matt DiBenedetto is in his first year with Leavine and theoretically has the same equipment as the Gibbs drivers. The difference is in depth and resources, and it makes Leavine an iffy proposition for Bell. A deal could be worked to get Bell in a second Leavine car, but expansion might stretch the small team too far. Bell could also just replace DiBenedetto, but isolating him on a mediocre extension of the big-league team is risky. Bell is considered a rising star because of his dirt track prowess, grassroots racing fan base and his hard-charging style - and racing is a results-driven business. Sticking Bell with the B-team just to get him a seat could backfire if he struggles. Dave Wilson, president and general manager of Toyota Racing Development, noted driver lineups are up to teams. But he knows the resources that have been put into developing Bell, Jones, Suarez (who now drives a Ford), and even K&N Series driver Hailie Deegan. "As Toyota has been vested in driver development for several years, we accept that these types of logjams are inevitable," Wilson said. "We're still working with all of our team partners on 2020 plans, but don't have anything to talk about right now." The Bell situation needs to be solved. He is ready now and NASCAR is ready for him now. It's not the worst problem for Gibbs, but it could get complicated over the next few months.